Earn up to 10.5 CNE contact hours and 10.5 AAPA category 1 CME credits. The RNS’s Annual Forum Series continues with the 2019 Pacific Coast Rheumatology Forum (PCRF)! This event is a two day evidence-based accredited continuing education and networking experience that will enhance your skills to practice in the specialty of rheumatology and explain the impact an entire healthcare team provides to the patient. Registered nurses (RNs) and advanced practice providers (APPs) - which include nurse practitioners (NPs) and physicians assistants (PAs) will encounter engaging and innovative material that will transform daily practice and help to develop necessary skills for the overall treatment of their patients, families, and community. Join us from February 8-9, 2019 for a fun time of learning, networking, and growth! 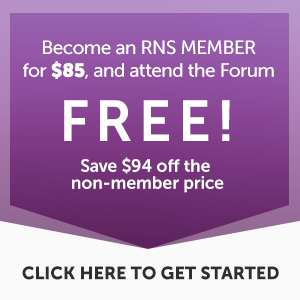 When you become a member of the RNS or sign in to register for the event, you can attend the Forum Series for free! We can’t wait to see you there.